RALEIGH, NC, July 23, 2013 – Jetcraft Corporation and its subsidiary Jetcraft Avionics LLC, today announced that their HUD Vision Access™ system is now available for sale and installation on the Bombardier Challenger 604 (CL604). Last month, Kollsman announced that the Federal Aviation Administration (FAA) had awarded a “lower landing credit” approved supplemental type certificate (STC) for the Kollsman enhanced flight vision system (EFVS) for the CL604. As a major Kollsman EFVS distributor to the business aviation aftermarket, Jetcraft has commercialized this offering and branded it as HUD Vision Access. Fully integrated with existing avionics, HUD Vision Access makes the CL604 a more flexible and valuable aircraft by allowing pilots to safely taxi, take-off and land in total darkness, fog, rain, snow, smog and other reduced visibility conditions. Under FAR 91.175, HUD Vision Access permits pilots to descend below decision height (DH/DA) at most airports, reducing the need for ground-based infrastructure. For owners and operators of CL604s, the principal benefits include additional operational credit at more than 4,000 runways across the country, during straight-in approaches with ILS or WAAS-LPV. 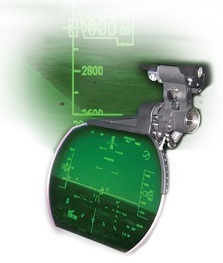 Implementation of the HUD Vision Access is a value-adding retrofit for CL604s in-line with the FAA’s new ‘NextGen’ initiative, which places increasing importance on cockpit-based (vs. ground-based) guidance systems. West Star Aviation, a leading US provider of maintenance, repair and overhaul (MRO) services with multiple authorized locations, has been selected by Jetcraft for system installations. West Star will sell and install HUD Vision Access as an integrated system, provisions or as separate components. “Jetcraft’s HUD Vision Access system makes the CL604 a more valuable aircraft,” says Chad Anderson, President, Jetcraft Corporation. “Based on our extensive experience in the remarketing of previously-owned business aircraft and independent analysis, we estimate the resale value of HUD Vision Access to be approximately 70% of new. Additionally, HUD Vision Access is a significant differentiator at resale, compared to a similar aircraft without this upgrade. Previously, EFVS was only available on new aircraft sold directly by OEMs. With HUD Vision Access now STC approved on the CL604, we look forward to continuing to work with the Kollsman team to pursue EASA approval and comparable retrofits for aftermarket Bombardier Challenger 605 and CRJ conversion fleets. Working with West Star Aviation to access this game-changing technology enables clients to derive more value from their aircraft investments,” adds Mr. Anderson. “We are pleased to be the leading installation facilities of Jetcraft’s HUD Vision Access system for CL604s,” continues Greg Byrnes, Senior Vice President, West Star Aviation. “We have considerable expertise with Challengers, specifically including avionics installations. The HUD Vision Access represents a major value-add for aircraft owners and operators. With recent FAA STC approval now established, we are ready to serve the more than 150 CL604 operators registered in the US,” concludes Mr. Byrnes. Jetcraft Corporation is an international leader in new and pre-owned business aircraft sales, acquisitions and trades. Headquartered in Raleigh, NC, Jetcraft has sales offices/representation in five US cities; Basel and Zurich, Switzerland; Dubai, UAE, Moscow, Russia and Hong Kong, China. The company’s 50-year-plus track record in aircraft transactions has earned it a world class customer base and one of the strongest global networks in the industry. Jetcraft Avionics LLC, a subsidiary of Jetcraft Corporation, provides distribution of enhanced flight vision systems (EFVS) for aftermarket business aircraft using Kollsman’s state-of-the-art EVS-II and AT-HUD. For more information, please visit www.jetcraft.com. West Star Aviation, Inc. specializes in airframe repair and maintenance, engine repair and maintenance, major modifications, avionics installation and repair, interior refurbishment, paint, parts, surplus avionics sales, window repair, landing gear overhauls and accessory services. The company also provides complete FBO services for transient aircraft at its East Alton, Illinois and Grand Junction, Colorado facilities. For more information, please visit www.weststaraviation.com.